SG-1 discovers the wreckage of an alien craft, and three armed survivors. Aden Corso introduces himself as the captain of the Seberus, from the planet Hebridan, and explains that he and his crew, Reynard and Pender, had been blown off course by an asteroid storm. Suddenly, humanoid creatures open fire from the woods, but as they are driven away, Reynard is wounded. Corso describes the creatures as savage natives who have been hunting his crew, and he asks SG-1 for help. Jonas returns to the SGC with Reynard for medical treatment, as Carter cooperates with Corso in an attempt to make repairs to the ship. As Jonas searches historical records for ties to the Hebridans, he grows suspicious of Reynard. She is anxious to learn all about the stargate, and when she is left alone in his office, she finds that she has access to secret computer files and gate addresses. Carter makes the disturbing discovery of a recorded distress signal identifying the Seberus as a prison transport vessel, and O'Neill and Teal'c also begin to doubt the Hebridans' story as they track the alien creatures. When they finally apprehend one of the elusive humanoids, he makes the startling claim that he is Warrick, the true captain of the Seberus. Warrick explains that Corso and his accomplices were his prisoners who had overpowered his crew and taken his vessel. When Jonas and Reynard return to the planet, Reynard tells the others what she has learned on Earth, and entices them with the riches beyond the stargate. Realizing they have been found out, the Hebridans hold Jonas hostage and attempt to make an escape as Reynard dials the gate. However, the address she acquired had been planted, and the prisoners step through the gate into the SGC where they are taken into custody. With his ship repaired, Warrick returns to Hebridan with his prisoners. Hebridan does not seem to have a stargate. The natives of Hebridan are probably descended from the ancient Celts. Their ancestors might have come from somewhere near the outer Hebrides Islands off the coast of Scotland. Warrick’s race is the Serrakin. 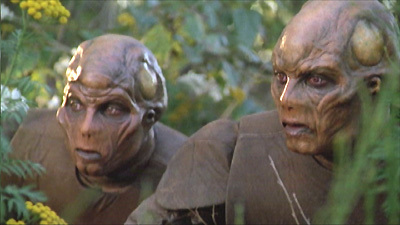 They helped liberate the Hebridan from the Goa’uld thousands of years ago, and brought them advanced technology. Since then they have lived in harmony. Warrick’s wife, Athea, is a human from Hebridan. The Seberus is a prison transport vessel. Three years ago, Warrick and a crew of seven were transporting Aden Corso and his accompices Lyle Pender and Tanis Reynard, to a prison colony. The ship hit an asteroid storm, began to lose power, and the only hope of survival was to land on P2X-005. The name “Seberus” may have been derived from “Ceberus.” The Ceberus of Dublin was built by the descendants of the ancient Celts on Earth in 1668, designed specifically to transport convicts to a penal colony. The Seberus uses liquid nitrogen to fuel an ion-propulsion system. Jonas is able to translate ancient Celtic. Major Pierce is the commanding officer of SG-15. You've seen Braveheart too often.